Alright, I'm going to go back to the homepage. I'll click back to site in Drupal 8 and I'll click the home button in Drupal 7, and I'll hide the toolbar again. Now our homepages have our article listed on it. The difference is that with Drupal 8 this is a view and we can click the edit link in the top corner of this view in order to edit the view. 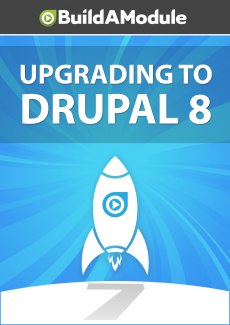 Now in Drupal 7 in order to do this you would need to install views. I've gone ahead and enabled views on this Drupal 7 site and we can get the same frontpage view by going to structure, views and then frontpage here. I'm going to enable it first and then I'll click edit to get to the same screen that we have here. Now views in Drupal 8 is very similar to Drupal 7. I've only been able to find a couple of differences and they've all been minor.